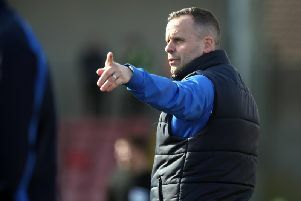 Ballymena United are becoming a force to be reckoned with after a 2-1 victory against Cliftonville in the Danske Bank Premiership on Saturday. Goals from Cathair Friel and Steven McCullough saw off the Reds and in their last four league outings they have beaten Crusaders, Glenavon, Glentoran and now Cliftonville. Cliftonville's goal came from substitute Conor McDonald but United deserved the three points. United entered the game being unbeaten in their last ten games in all competitions while the Reds have been in good form in recent weeks and sit fourth in the league standings before kick-off. Cliftonville started well and put pressure on the United defence but the Sky Blues were dealing well with the attacks and the game remained scoreless. United's Andy McGrory had a great chance and Reds keeper Brian Neeson made a fantastic save to deny the United defender. Ballymena's James Knowles tried his luck in the 25th minute. His shot was easily saved by Neeson in the visitors goal. It was end to end stuff and Jay Donnelly had a shot for the Reds in the 28th minute that was gathered by United keeper Thomas McDermott. On the half hour mark there was a melee after Joe Gormley was brought down and from the resulting free-kick the ball was cleared but the game was warming up. In the 39th minute the Reds brought on Conor McMenamin for Jay Donnelly - who looked less than happy even thought he seemed to be carrying an injury. Levi Ives tried his luck from a free-kick two minutes from the break. Keeper McDermott scrambled but it flew just wide. United's Jude Winchester tried his luck a minute later but Neeson pulled off another great save. United had the ball in the net from the resulting corner. However referee Arnold Hunter ruled it out because of a handball in the box. Three minutes into the second half it was 1-0 to the home side as Friel sprinted clear to volley past Neeson in the Clifonville goal. A good goal from the striker and a great start to the second half for the Sky Blues. Friel tried his luck again in the 54th minute as he rifled one over from the edge of the box. It should have been 2-0 in the 57th minute, Jude Winchester's shot was well saved by Neeson. It feel to Friel but his shot was pushed away by Neeson. The striker should have scored his second of the afternoon. In the 76th minute it was 2-0 and what a finish. McCullough curling home a beautiful free-kick with his left foot. The defender curling his effort over the wall, giving keeper Neeson no chance. It was 2-1 in the 83rd minute as McDonald scoring from a Joe Gormley cross and the Reds were right back in it. A fine finish from the sub. Then right on 90 minutes Friel was put through by Winchester but his effort was well saved by Neeson - who was having a good game. The Reds had a chance in added time. Substitute James Harney connected with a corner to head over.